Before it opens anywhere else in the world, CAPTAIN AMERICA: THE FIRST AVENGER will open first in Comic-Con. Convention goers in San Diego will be the first audience to see one of the summer’s hottest super heroes beginning at noon PST on Thursday, July 21st, 1-day ahead of its US opening. The movie will play exclusively at the UA Horton Plaza with Captain America-themed festivities happening throughout the day. To help kick-off the day, Paramount and Marvel will host an exclusive free fan screening at 10 A.M. with the movie’s star Chris Evans on-hand to introduce the screening. In addition to being among the first to see the movie, all CAPTAIN AMERICA: THE FIRST AVENGER ticketholders will receive RealD® 3D Collector’s Custom red, white and blue CAPTAIN AMERICA: THE FIRST AVENGER glasses and a limited edition poster designed exclusively for the fans. A grand prize package of CAPTAIN AMERICA: THE FIRST AVENGER merchandise and other Marvel items will be given away to a select audience member at each screening. USO-costumed women will be standing at the American Flag Pole in the Horton Plaza passing out free tickets every hour beginning at 11:00 A.M. to the first 10 people who come dressed as Captain America. CAPTAIN AMERICA: THE FIRST AVENGER, directed by Joe Johnston, from a screenplay by Christopher Markus & Stephen McFeely, will focus on the early days of the Marvel Universe when Steve Rogers (Chris Evans) volunteers to participate in an experimental program that turns him into the Super Soldier known as Captain America. 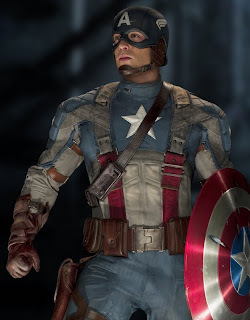 As Captain America, Rogers joins forces with Bucky Barnes (Sebastian Stan) and Peggy Carter (Hayley Atwell) to wage war on the evil HYDRA organization, led by the villainous Red Skull (Hugo Weaving). One of a continuing slate of films being produced by Marvel Studios based on the Marvel characters, CAPTAIN AMERICA: THE FIRST AVENGER joins Thor which was released on May 6, 2011 and Marvel’s The Avengers which is coming to theaters on May 4, 2012.” Paramount Pictures will distribute CAPTAIN AMERICA: THE FIRST AVENGER nationwide on July 22, 2011.